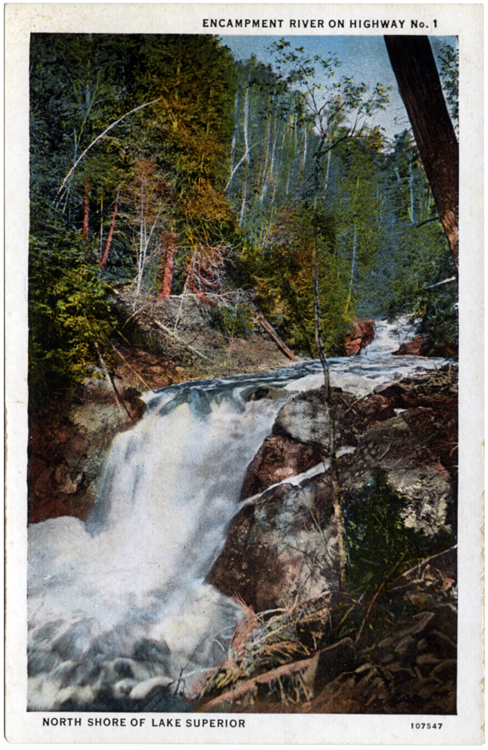 In 1921 Thomas Winter described the Encampment River as “a beautiful trout stream cascading through a rocky gorge, leaping in several falls down the hillside, with here and there deep pools where the trout lie.” Winter, along with Edwin Hewitt and Frances Shenehon, had just purchased 1,575 acres surrounding the Encampment from the estate of Two Harbors resident John Olson. Doing so, they created the Encampment Forest Association and inadvertently helped preserve a small portion of Minnesota’s original pine forest. Since it was private land throughout the peak of North Shore logging in the 1890s, the area was remarkably intact and makes up part of the remaining 1 percent of the state’s pine forest. Today the area surrounding the river contains white pines that are over two hundred years old (white pines are susceptible to blister rust, a disease imported from Europe) and an abundance of ancient cedars. The Encampment itself begins in a large swamp about twelve miles north of the lake shore. It winds its way south, dropping forty feet down its Upper Falls and, a half mile later, another twenty as it passes over Lower Falls. Encampment Island is found offshore near the mouth of the river, just south of where the steamer Lafayette sank in the great storm of 1905.